A sunset view to the Crystal Range from the Ellis Peak Trail. Photo taken August 12, 2003, by Petesthousandpeaks. Novice peak climbers might start doing the easier ones, with official, graded, trails built up to the top. Sierra Buttes, Mt. Lola, Mt. Judah, Mt. Rose, and Thunder Mountain fit this category well. You will have to closely read the route descriptions to determine that many more of these "wild" peaks have trails or use trails going close to the top. Moving on to a challenge, one might strive for height, generally looked for in the southern summits. The peaks get higher, on average, as one looks southeast along the Sierra crest. Technical difficulty is found with Jeff Davis Peak and Thimble Peak, both class 4, or Round Top and Castle Peak, with their considerable sections of class 3 route-finding. Spectacular views can come from popular peaks like Mt. Tallac, with its tough trail to the panoramic vista of Lake Tahoe, or Highland Peak, with the pristine Carson-Iceberg Wilderness about. Good winter ski ascents are found in the class 1 or 2 peaks near the major plowed highways. Ralston Peak seems to be skied often, and one of my favorites is Rubicon Peak. I've rated Silver Peak (south) as the overall most difficult peak, with its large amount of trailless gain, even though it doesn't exceed class 2. Nearby Highland Peak does have its use trail, and the PCT runs by it more closely. With a good vehicle, one could nearly drive-up Genoa Peak, or buzz Ellis Peak with a dirt or mountain bike. If you like to combine fourwheeling with hiking, the desert peaks like Mt. Como and Mt. Siegel offer vastly different terrain than the Sierra. For plain solitude, some seek out the Sweetwater Mountains, which most hikers ignore. The area about Sonora Pass and Ebbetts Pass is the furthest from the major cities, so tend to be less visited, to the delight of backpackers and hunters. Most climbers work on a peaks list. The entirety of this guide offers a "list" that only a few have completed, and is beyond most, but for the most determined of summiteers. Many summits will have registers, which should be signed, if you wish to be credited by whatever peak climbing group. The "leave no trace" entreaty applies to other, more natural, features. Most of us don't buy the glib explanation for your signature's absence that it was too hard or immodest to put your "proof" that you were there. More than likely, you never climbed it! No summit photos don't "prove" your ascents, either! Due to the advent of what is termed, "photoshopping," I now record my ascents for posterity by a "summit twirl." It seems impractical and improbable that someone would "fake" HD video for a peak ascent credit. Many jurisdictions now disallow summit registers, by them. My word is that rangers are sent to remove them. Suggestions on how to perform a video selfie to show that a climber is truly atop a peak is described in a link at the Nevada Peaks Club pages. Examples of my own summit twirls are viewable on my videos captured atop a summit. With presently inexpensive cameras or smartphones, I fail to accept that for any "proof," this is not widely adapted. "Wag Bags" are now available from certain ranger stations (about $3, 2012). Please have some ready to help preserve backcountry water quality, if needed, and do pack them out. I am not told if there are any official places to leave them, but by some laws, you can dispose of them into some garbage containers headed for a public landfill, if done in a sanitary fashion. The easy way to deal with human bodily waste is to use a proper restroom facility before your hike or climb, clearing out your system. Some businesses enroute offer the opportunity, with a customer purchase. Some official trailheads also have facilities, so please use them as a last resort. It is possible to do any peak without any pollution. Due to my own personal concerns, I have been using a "pee" bottle. This is practical during day climbs. For the most part, aside from footprints, my peak bagging is near zero impact. My plans for the future are to obtain a zero emissions vehicle. Yes, there are climbers who just wish to meet people. The ones with the trails would appeal more then, so the peaks that start at official trailheads would seem to offer better ops for social contact. For some reason, Pyramid Peak gets climbed a lot. Freel Peak is done now via the Tahoe Rim Trail, so look for your "company" there, too. Many people will want their namesake mountain, or perhaps just climb what they've been seeing from town all their city-bound lives. The reasons to climb a peak may stretch from "because it's there" to "why not?" But for most, you will not summit as part of a carefree hike to head somewhere. Going to the top of a major Northern Sierra peak requires forethought and planning. Study your opportunities prior to setting out, and know your own ability lest you become another statistic. There are thousands of bumps to qualify as highpoints, but only a few of them are worthy, named peaks. I sincerely hope that this brief transgression upon picking favorites might help you on what will hopefully be the best summer or winter wild escape you will have ever had! Climb smart, and be safe! 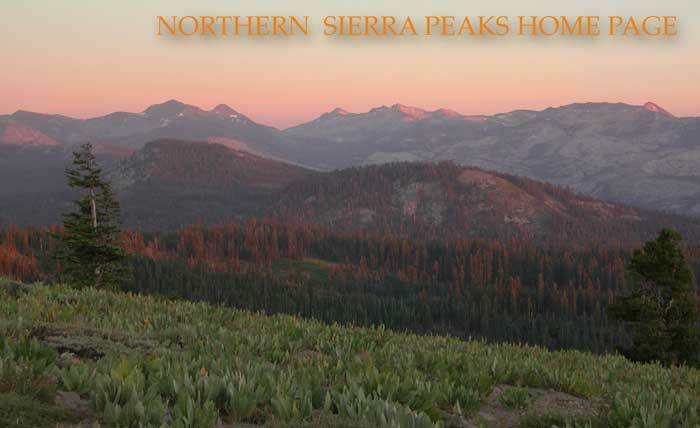 ENTER THE WORLD OF THE NORTHERN SIERRA PEAKS GUIDE! !